› Author AffiliationsThe authors thank the financial support from the following grants: FONDECYT Grants 1161297 and 1141138. A novel and convenient synthetic route towards dialkyl as-indacenes was achieved by alkylation of malonic esters with o-xylylene dibromide, to give the corresponding tetraester, and related diacid. The alkyl groups on the central benzene ring induce intramolecular, regiospecific cycloeliminations leading selectively to the diketones, the precursors of the corresponding 1,8-dihydro-as-indacenes. The structure of the 2,7-dimethyl-1,8-dihydro-as-indacene was determined by X-ray diffraction. 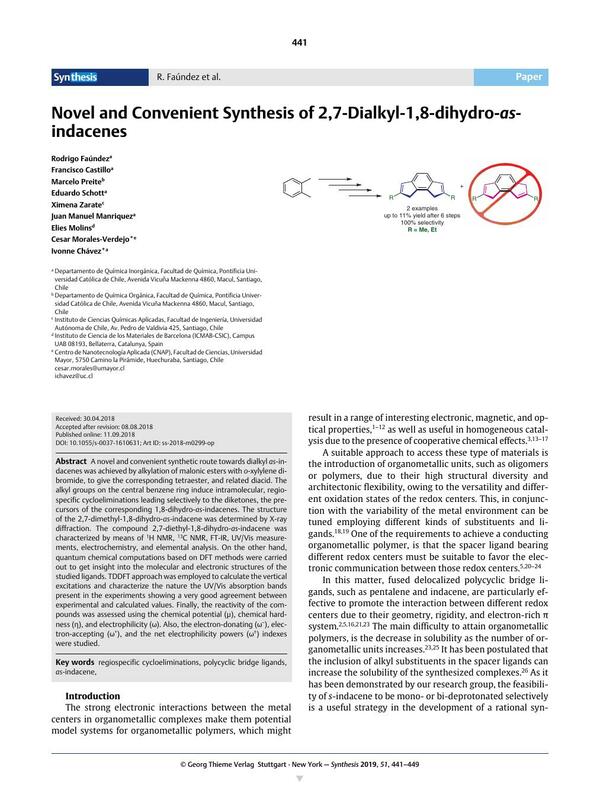 The compound 2,7-diethyl-1,8-dihydro-as-indacene was characterized by means of 1H NMR, 13C NMR, FT-IR, UV/Vis measurements, electrochemistry, and elemental analysis. On the other hand, quantum chemical computations based on DFT methods were carried out to get insight into the molecular and electronic structures of the studied ligands. TDDFT approach was employed to calculate the vertical excitations and characterize the nature the UV/Vis absorption bands present in the experiments showing a very good agreement between experimental and calculated values. Finally, the reactivity of the compounds was assessed using the chemical potential (μ), chemical hardness (η), and electrophilicity (ω). Also, the electron-donating (ω–), electron-accepting (ω+), and the net electrophilicity powers (ω±) indexes were studied. Crystallographic studies (CIF) for compounds 6a and NMR data related to this article are available online at https://doi.org/10.1055/s-0037-1610631. 41 Armarego WL. F. Chai CL. L. Purification of Laboratory Chemicals . Butterworth-Heinemann; Oxford: 2009. 6th ed.